“Alice” Artificial Intelligence for the business world. Our innovative new technology is at the leading edge of the paper shredding industry. Our unique sensor transmits empty space readings to insure your bin is full every time its picked up. No more monthly pickups, “Alice” will notify you when your Shred Bin is full and scheduled for clean out. We’ll be there, when you need us. Our Best in class document handling procedures ensure your security at every check point. Your shredded waste will be is tracked throughout the shredding process. A certificate of destruction is issued on each servicing. Our Shred bins are equipped with a cellular connected sensor that communicates empty space readings with our data management system. 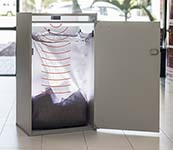 This ensures your bins are emptied only when needed for one low fee. Our greatest advantage is the ability to provide our customers with a best price guarantee coupled with our industry leading service and security. Our pricing is one low fee per shred bin clean out. How many Shred Bin smart consoles needed at location?